This is a consignment item. A 3% buyer's premium ($2.19) will be charged at checkout. Cover art by Howard Chaykin. 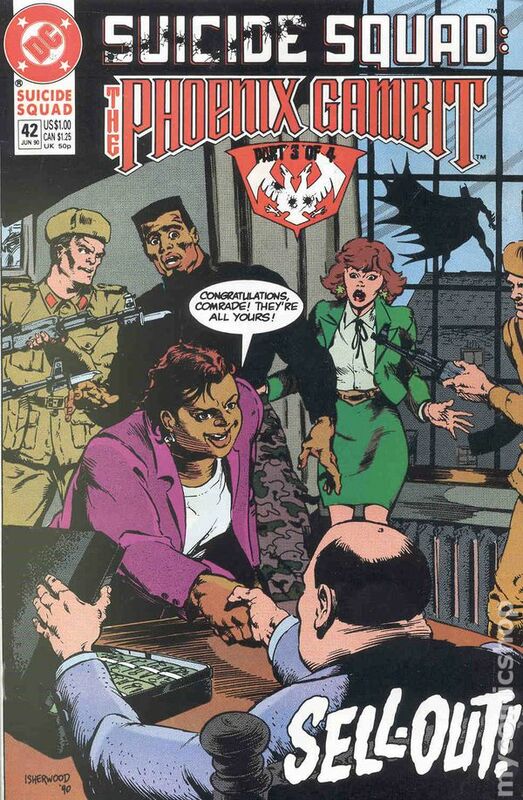 Trial by Blood, script by John Ostrander, pencils by Luke McDonnell, inks by Karl Kesel; Amanda Waller organizes a mission to take down the Jihad before they can attack the U.S. Bob Greenberger talks about how this series was developed. 36 pgs. $0.75. Cover price $0.75. Cover pencils by Luke McDonnell, inks by Karl Kesel. 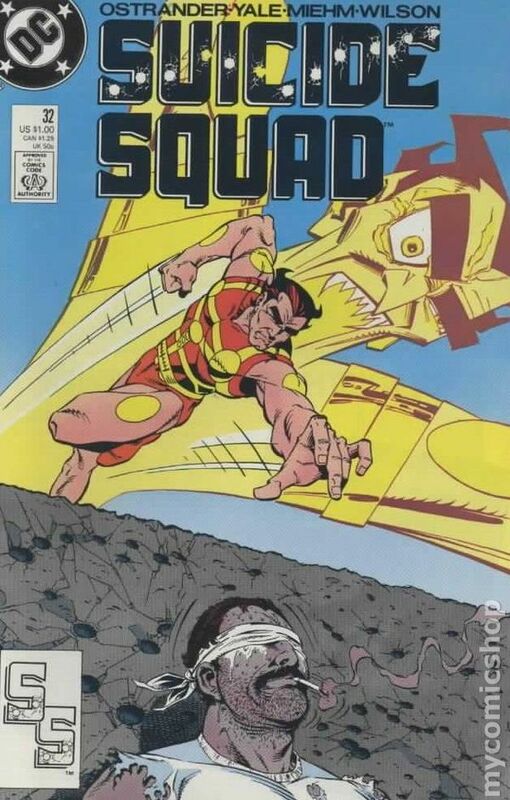 Trial by Fire, script by John Ostrander, pencils by Luke McDonnell, inks by Karl Kesel; The Squad goes to Qurac to put an end to the Jihad before they can go on their first mission. One of them doesn't come back. 36 pgs. $0.75. Cover price $0.75. Cover pencils by Luke McDonnell, inks by Karl Kesel. 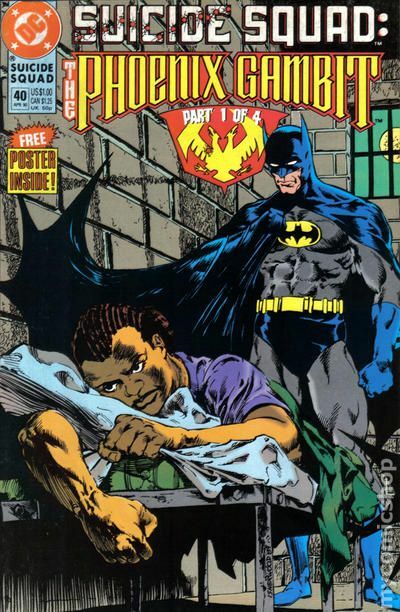 Jailbreak, script by John Ostrander, pencils by Luke McDonnell, inks by Karl Kesel; Most of the team survived the first mission and now they come back to Belle Reve for some rest; However, the rest won't last for long because Darkseid has decided it's time for G. Gordon Godfrey to come home; To free him from custody, he dispatches the Female Furies. 36 pgs. $0.75. Cover price $0.75. Cover pencils by Luke McDonnell, inks by Bob Lewis. 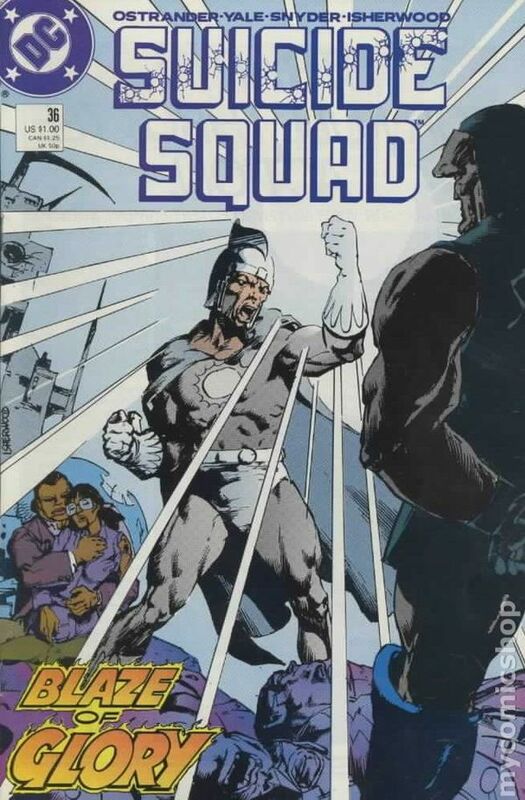 William Hell's Overture, script by John Ostrander, pencils by Luke McDonnell, inks by Bob Lewis; The Squad is sent in to discredit a white supremacist. Cover price $0.75. Cover pencils by Luke McDonnell, inks by Bob Lewis. 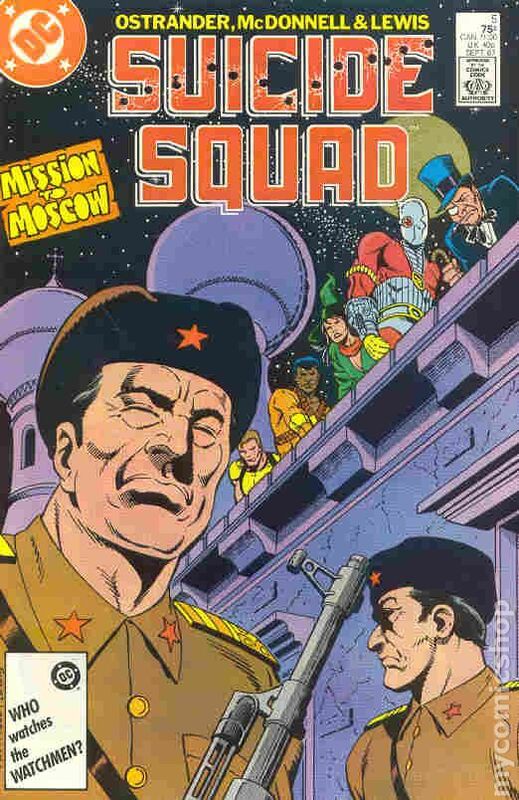 The Flight of the Firebird, script by John Ostrander, pencils by Luke McDonnell, inks by Bob Lewis; The Squad is sent into Russia to bring back a now-famous dissident; To get in and around the USSR is no easy deal, especially when they will have a wanted prisoner with them so they need some extra-special planning; Amanda produces the one person who can do it with cunning and an understanding of the Russian winter--The Penguin. 36 pgs. $0.75. Cover price $0.75. 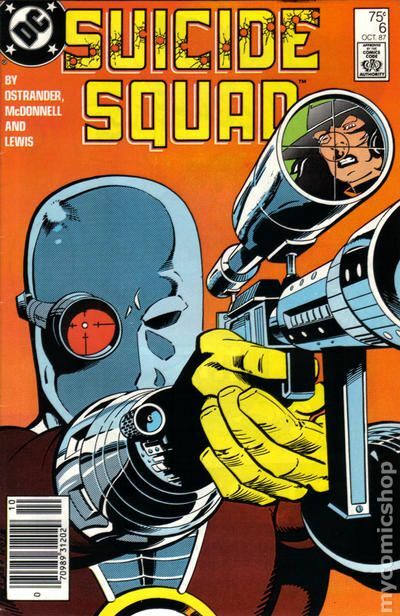 Deadshot cover and appearance. Cover pencils by Luke McDonnell, inks by Bob Lewis. 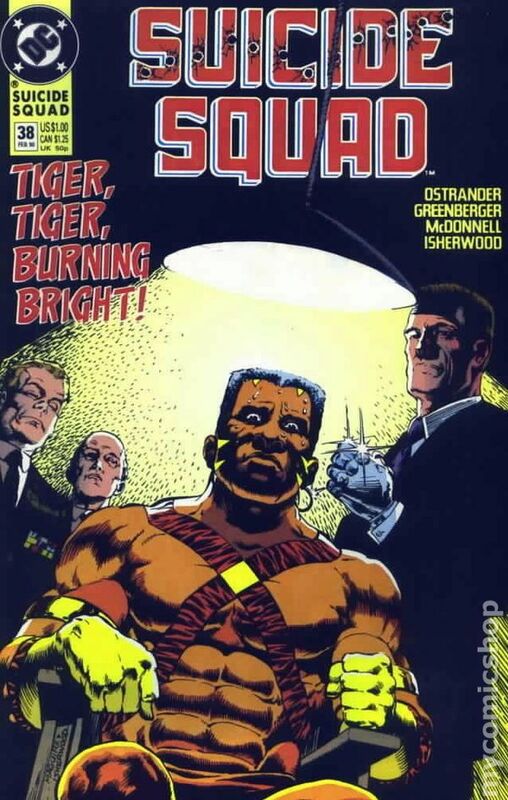 Hitting the Fan, script by John Ostrander, pencils by Luke McDonnell, inks by Bob Lewis; Okay, so the team is in Russia and now they know their subject does not want to be rescued; What could possibly complicate things more? ; Well, for starters, how about Enchantress going bonkers or the entire Russian army being mobilized against them? ; It's a wild ride across the vastness of Russia as the team seeks asylum. 36 pgs. $0.75. Cover price $0.75. Cover art by Jerry Bingham. 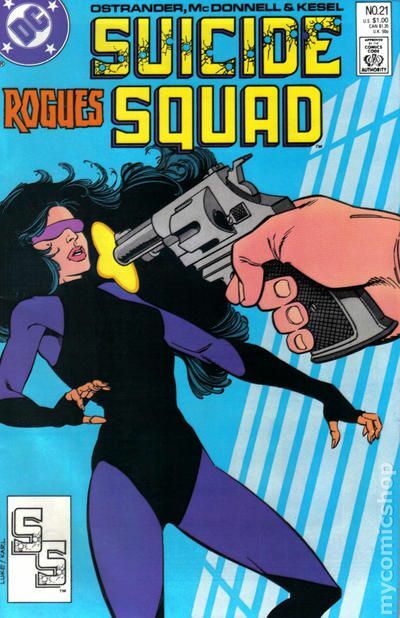 Thrown to the Wolves, script by John Ostrander, pencils by Luke McDonnell, inks by Bob Lewis; The Squad is trapped in Russia; The US Embassy wants nothing to do with the team; The Russians have called out the army; The Suicide Squad is on the run, Enchantress has lost contact with reality and Nightshade is hurt; What could possible complicate matters? ; It's time for the Russians to send in the People's Heroes to aid the army. 36 pgs. $0.75. Cover price $0.75. Cover art by Jerry Bingham. Personal Files, script by John Ostrander, pencils by Luke McDonnell, inks by Bob Lewis; It's time for a breather. Everyone is feeling terrible; Flag argues with Amanda with disastrous results; Enchantress causes June enough troubles that Bronze Tiger takes her to New York and Madame Xanadu for some serious, mystical help. Deadshot and Marnie spark; Captain Boomerang starts a new hobby; And Nemesis is still in Russia; So, it must be time to collect notes for the "Personal Files" of Dr. LaGrieve. 36 pgs. $0.75. Cover price $0.75. Millennium 4. Cover art by Jerry Bingham. 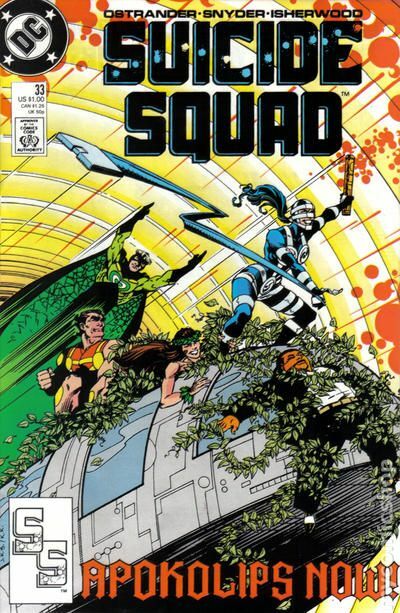 The Final Price, script by John Ostrander, pencils by Luke McDonnell, inks by Bob Lewis; The Suicide Squad is sent in to destroy the Manhunter's temple; Karin Grace is revealed to be a Manhunter, but she changes sides before she dies. 36 pgs. $0.75. Cover price $0.75. Cover art by Jerry Bingham. Up against the Wall, script by John Ostrander, pencils by Luke McDonnell, inks by Bob Lewis; Batman has found out about the existence of the Suicide Squad, and he doesn't like it. 36 pgs. $0.75. Cover price $0.75. Cover art by Jerry Bingham. 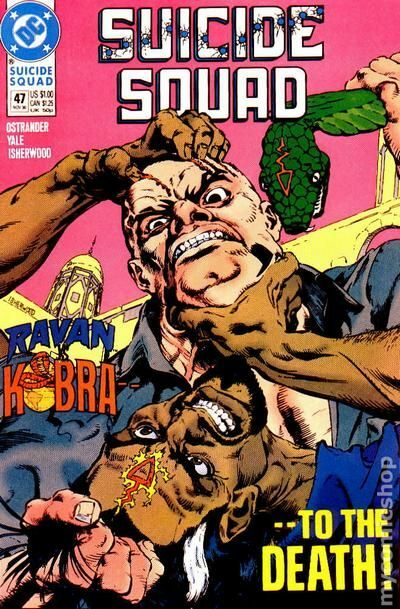 Blood and Snow, Part One, script by John Ostrander, pencils by Luke McDonnell, inks by Bob Lewis; Speedy leads the Squad on a mission (with Boomerang, Nightshade, Enchantress and Black Orchid) against a Columbian drug king. 36 pgs. $0.75. Cover price $0.75. Cover art by Jerry Bingham. 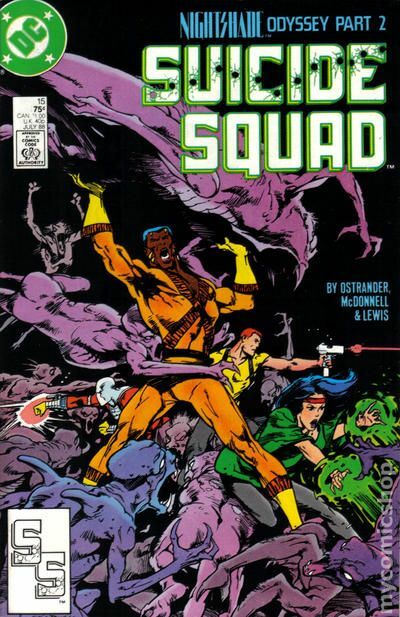 Blood and Snow, Part Two, script by John Ostrander, pencils by Luke McDonnell, inks by Bob Lewis; The mission in Columbia continues, and in true Squad style, everything goes wrong; We have Vixen and the Black Orchid trapped in the fortress and we have the rest of the team on the outside; The deciding act falls to June Moone who must summon forth Enchantress, but can the Squad keep her madness in check long enough to smash the drug pipeline? ; And how does Speedy react when confronted by corruption and greed to the nth degree? 36 pgs. $0.75. Cover price $0.75. Cover pencils by Steve Leialoha, inks by Al Gordon. 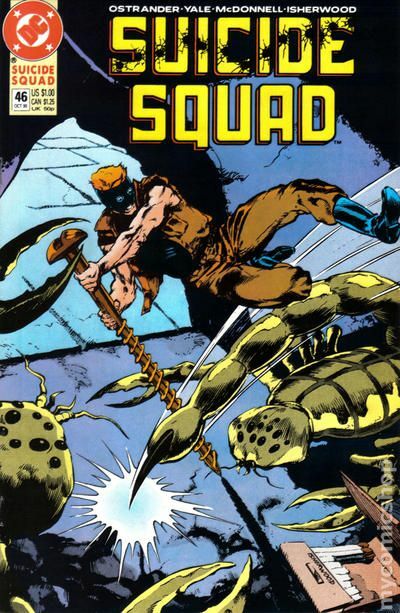 Battle Lines, script by John Ostrander, pencils by Luke McDonnell, inks by Bob Lewis; The JLI and the Suicide Squad have a stand off in a Russian prison, with the life of Nemesis at stake. 36 pgs. $0.75. Cover price $0.75. 'Nightshade Odyssey,' part 1 of 3. 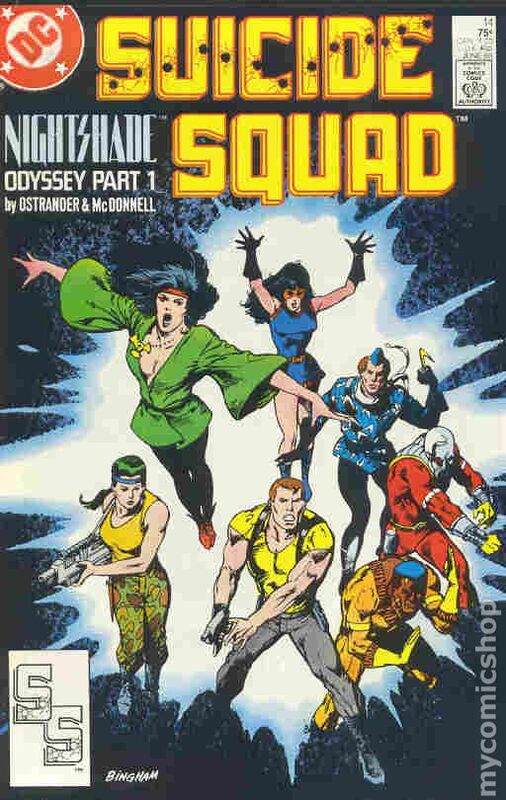 The Squad's latest mission: rescue Nightshade's brother from the Land of the Nightshade, where he's been trapped for a decade. Written by John Ostrander, with art by Luke McDonnell. Cover by Jerry Bingham. Cover price $0.75. 'Nightshade Odyssey,' part 2 of 3. There's more trouble brewing in Washington...and that's the best news the Squad's heard all day. It's the fate of the Enchantress and the change in Nightshade's brother that's really got them down. 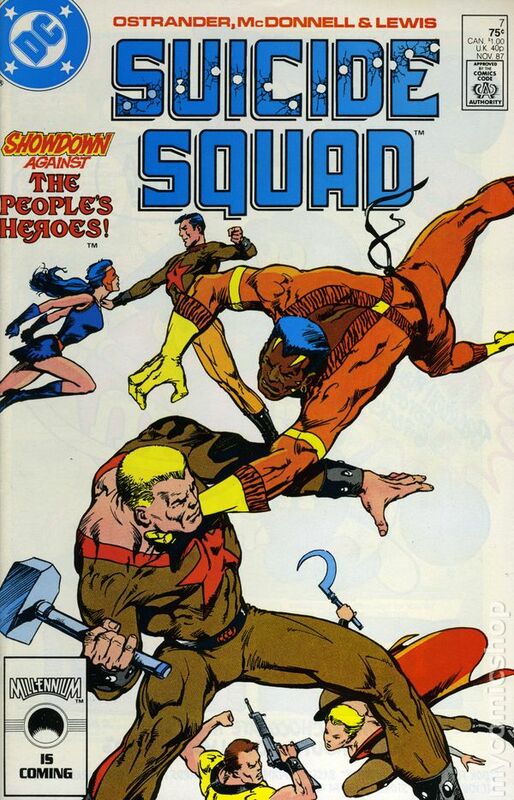 Written by John Ostrander, with art by Luke McDonnell and Bob Lewis. Cover by Jerry Bingham. Cover price $0.75. 'Nightshade Odyssey,' part 3 of 3. 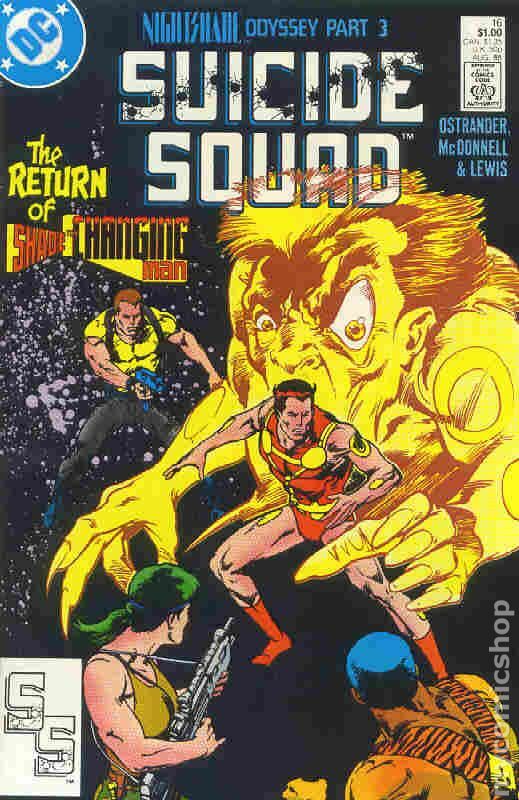 The final part of the odyssey as the Squad takes a wrong turn...and winds up in the Meta Zone, home dimension to one of DC's strangest heroes, Shade the Changing Man. 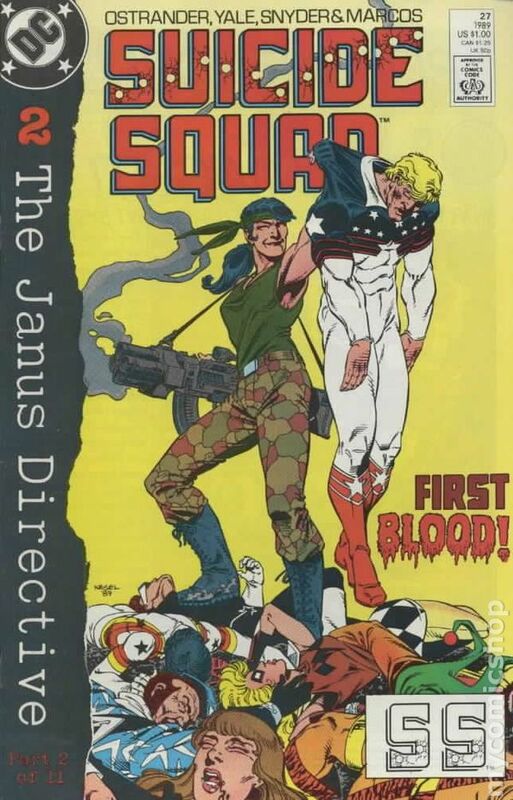 Written by John Ostrander, with art by Luke McDonnell and Malcolm Jones III. Cover by Jerry Bingham. Cover price $1.00. Just when it looks like the Squad can take some time off, the Jihad holds Manhattan for ransom, demanding a rematch to the death. 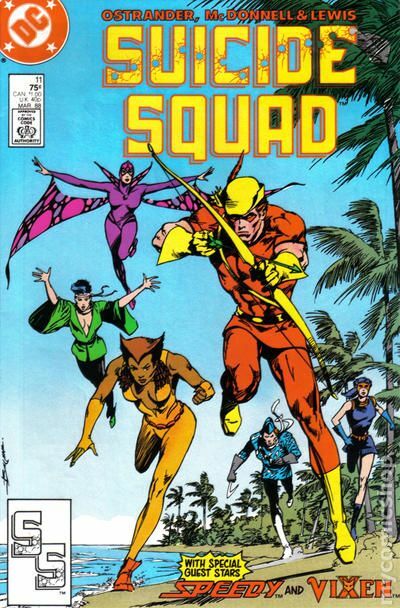 Written by John Ostrander, with art by Luke McDonnell and Bob Lewis. Cover by Joe Brozowski and Karl Kesel. Cover price $1.00. 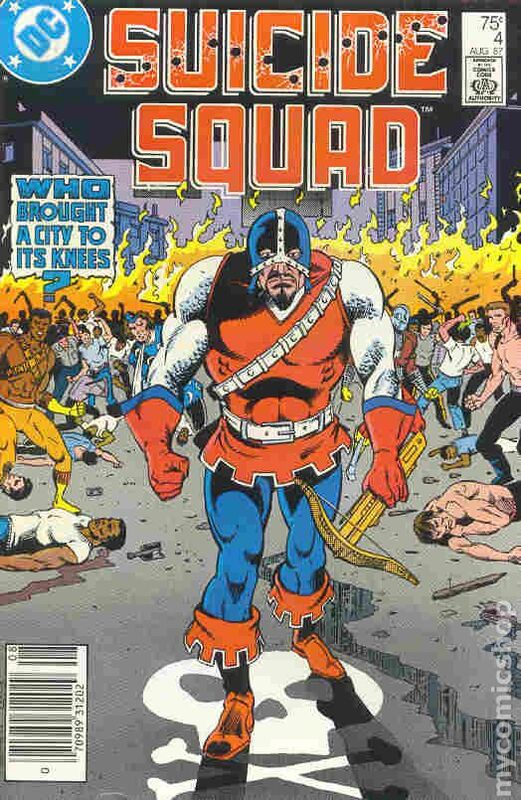 The Jihad brings its worst to Manhattan...but the Suicide Squad is right on its tail. Plus, the debut of a new costume and new powers for Nightshade. Written by John Ostrander, with art by Luke McDonnell and Bob Lewis. Cover by Joe Brozowski and Karl Kesel. Cover price $1.00. 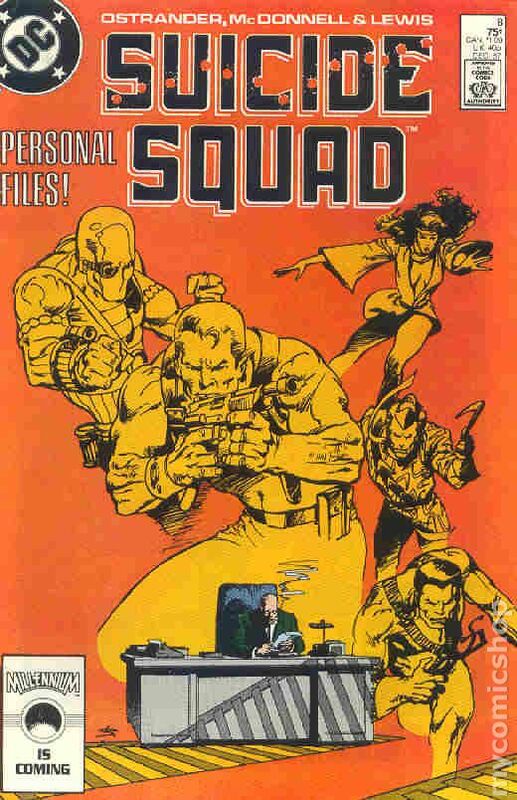 "Personal Files" Operating the Squad hasn't been without cost, as Amanda Waller discovers when she pauses to reflect on the lost souls that form the team. 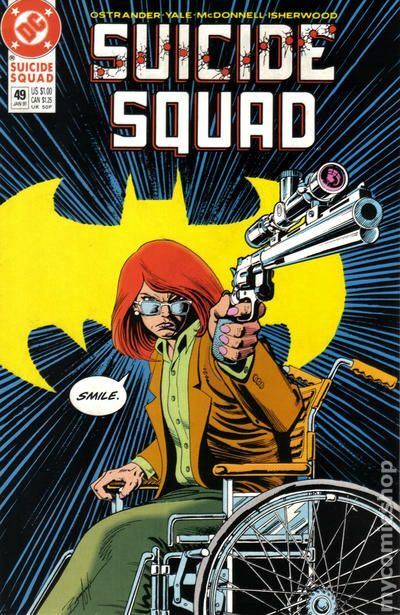 Written by John Ostrander, with art by Luke McDonnell and Bob Lewis. Cover by McDonnell. Cover price $1.00. 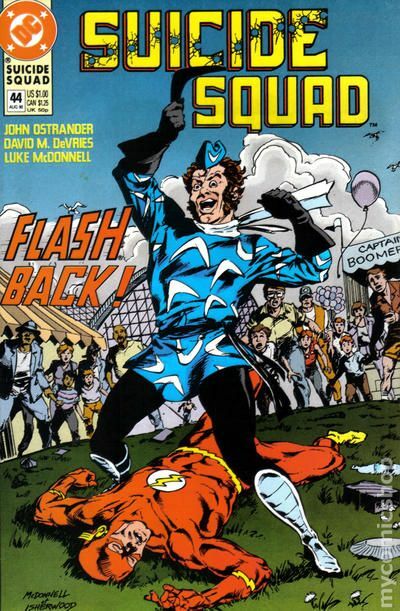 Captain Boomerang is the new Mirror Master, right? That's going to make it awfully tough for the not-so-good Captain and Mirror Master to go on a mission together. Written by John Ostrander, with art by Luke McDonnell and Bob Lewis. Cover by Karl Kesel. Cover price $1.00. Cover by Luke McDonnell and Karl Kesel. 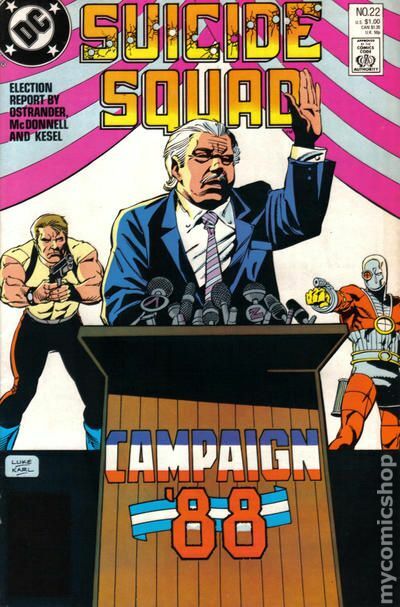 Rogues, script by John Ostrander, art by Luke McDonnell and Karl Kesel; With the political conventions over, the election race is on and Senator Cray demands action from the Squad; What will happen? To start with, Flag goes AWOL, Amanda has a showdown with Derek Tolliver, June and Eve have an interesting encounter and everything is about to hit the fan all over again. DC Bonus Book #10 Deadly Perspective, script by Larry Ganem, art by Peter Krause and Fred Butler; Bronze Tiger must take down a deadly assassin. Article discussing the bonus books and a brief biography of this books creators. 52 pgs., full color. $1.00. Cover price $1.00. Cover by Luke McDonnell and Karl Kesel. 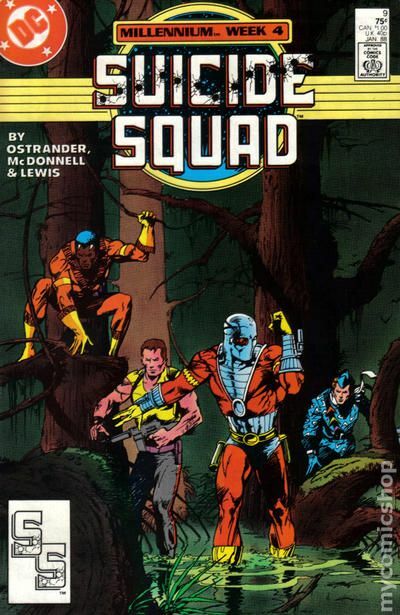 Final Round, script by John Ostrander, art by Luke McDonnell and Karl Kesel; Deadshot returns to the Squad just in time to go hunting after Rick Flag; Everything about the Squad is about to take a turn for the worse and death is in the air. Amanda Waller, Shade, Duchess, Vixen, Bronze Tiger, Black Orchid, Lois Lane, Perry White, Jimmy Olsen, Nightshade, Nemesis, Captain Boomerang, Rick Flag app. Preview of cover to Suicide Squad #23. 36 pgs., full color. $1.00. Cover price $1.00. 1st cameo appearance of Oracle (Barbara Gordon) from Birds of Prey. Cover by Luke McDonnell and Karl Kesel. 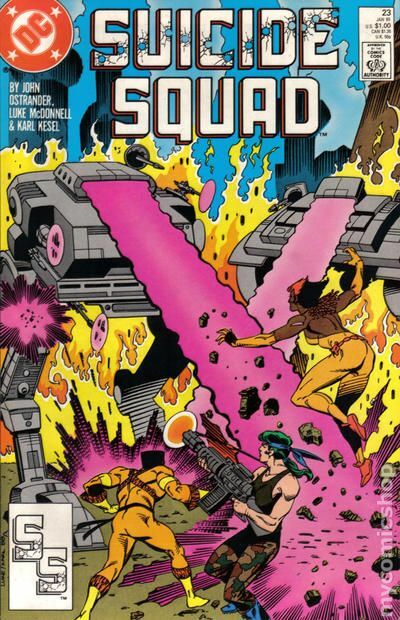 Weird War Tales, script by John Ostrander and Kim Yale, art by Luke McDonnell and Karl Kesel; The Squad splits up to fight aliens in Russia and Australia. Invasion tie-in. Story continued in Invasion #3. 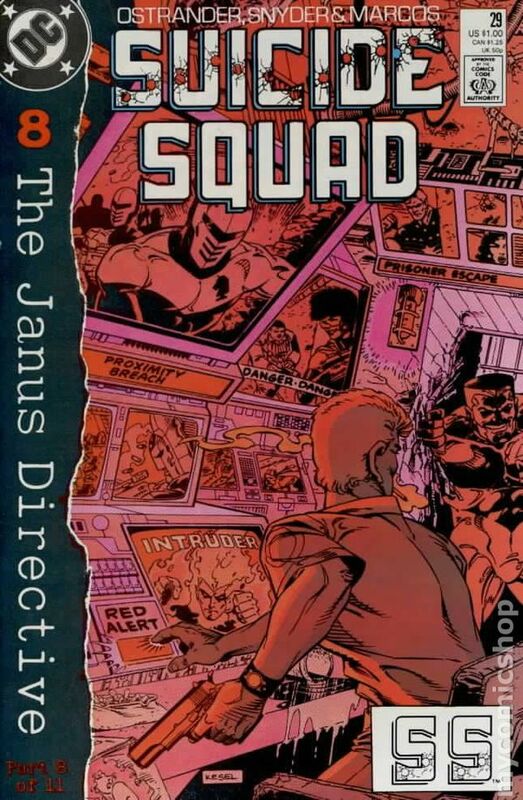 Deadshot, Amanda Waller, Thanagarians (Hawkman), Rocket Reds, New Guardians, Captain Boomerang app. 36 pgs., full color. $1.00. Cover price $1.00. Cover by Luke McDonnell and Karl Kesel. 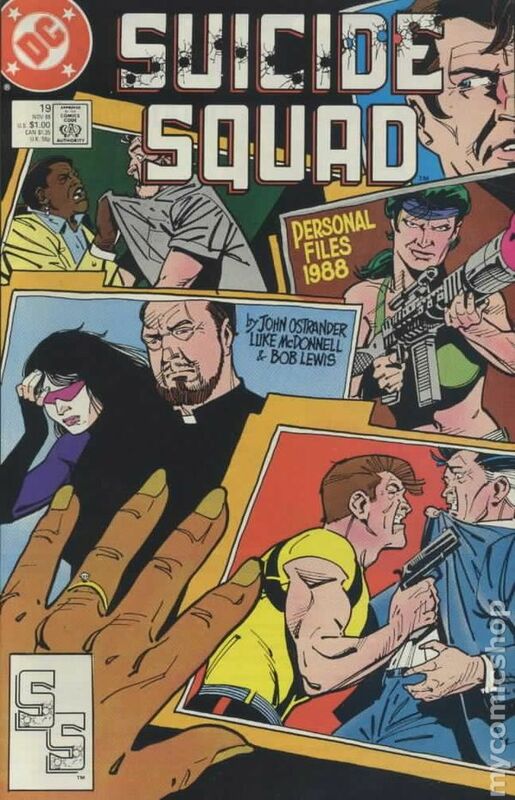 Slings and Arrows, script by John Ostrander and Kim Yale, art by Luke McDonnell and Karl Kesel; Government hearings begin concerning the Suicide Squad; The Squad itself is in Africa trying to rescue a kidnapped nun. Amanda Waller, Count Vertigo, Doctor Light II, Nemesis, Bronze Tiger, Nightshade, Shade, Duchess, Shrike, Ravan, Vixen, Captain Boomerang app. 36 pgs., full color. $1.00. Cover price $1.00. Cover by Karl Kesel. 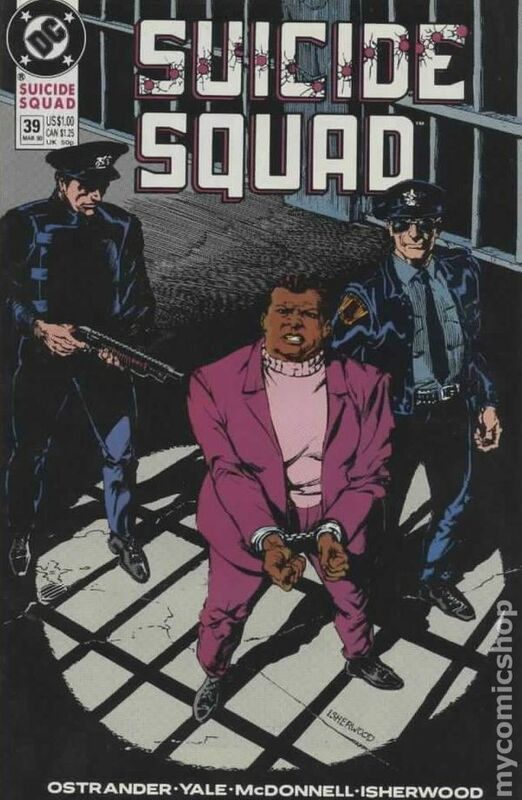 Sea of Troubles, script by John Ostrander, art by Grant Miehm and Karl Kesel; The government's investigation of the Squad concludes; The Squad rescues a nun from the African government where she is being held; Amanda Waller is removed as head of the Suicide Squad, but hires an actor as her replacement. Count Vertigo, Doctor Light II, Nemesis, Bronze Tiger, Nightshade, Shade, Duchess, Shrike, Ravan, Vixen, Captain Boomerang, Checkmate app. Preview of cover to Suicide Squad #26. 36 pgs., full color. $1.00. Cover price $1.00. Cover by Karl Kesel. Stone Cold Dead, script by John Ostrander, art by Grant Miehm and Karl Kesel; Flag activates a nuke hidden under the Jihad's base. Justice League International #27 and Animal Man #10 take place during this issue. The reader sees a Batgirl doll next to Oracle's computer, the first clue to Oracle's identity. 36 pgs., full color. $1.00. Cover price $1.00. Cover by Karl Kesel. The Janus Directive, Part 2: Scattermove, script by John Ostrander and Kim Yale, art by John K. Snyder III, Pablo Marcos, and Pablo Marcos; Waller introduces the leaders of Task Force X to a secret operation known as the Janus Directive whereby either the Force of July or Project Atom is going to turn on them and try to seize power in the covert intelligence community; Waller tells her allies that she wants to strike first and take out the two teams. 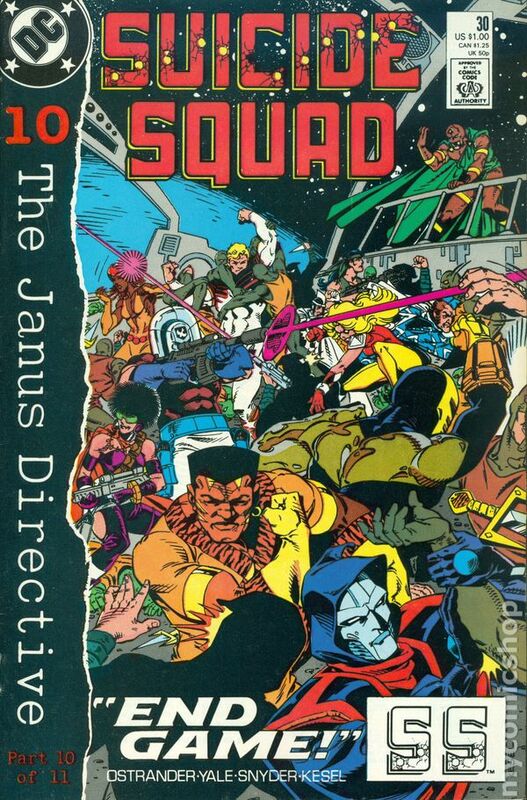 She sends the Suicide Squad after the Force of July and tells Bronze Tiger that she wants them dead; Ben is uncomfortable with this, especially as Oracle can't confirm that the Janus Directive even exists; The Squad battles the Force. 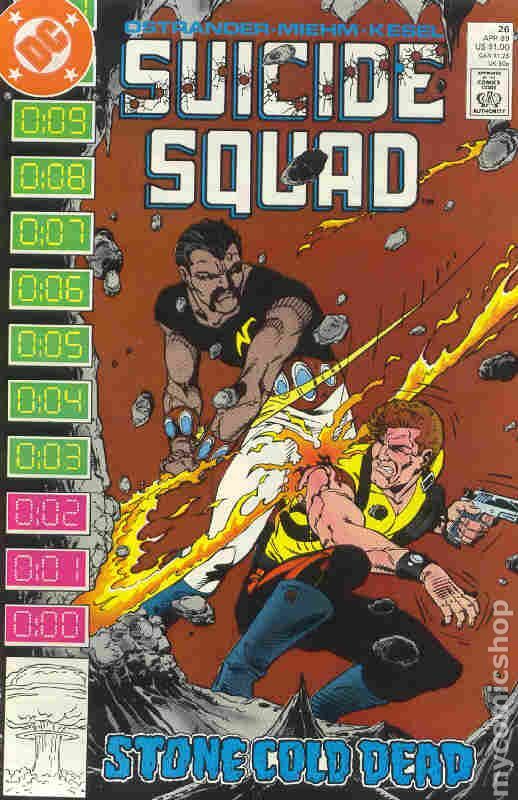 Story continued from Checkmate (DC, 1988 series) #15 and continues in Checkmate (DC, 1988 series) #16. 36 pgs., full color. $1.00. Cover price $1.00. Cover by Karl Kesel. 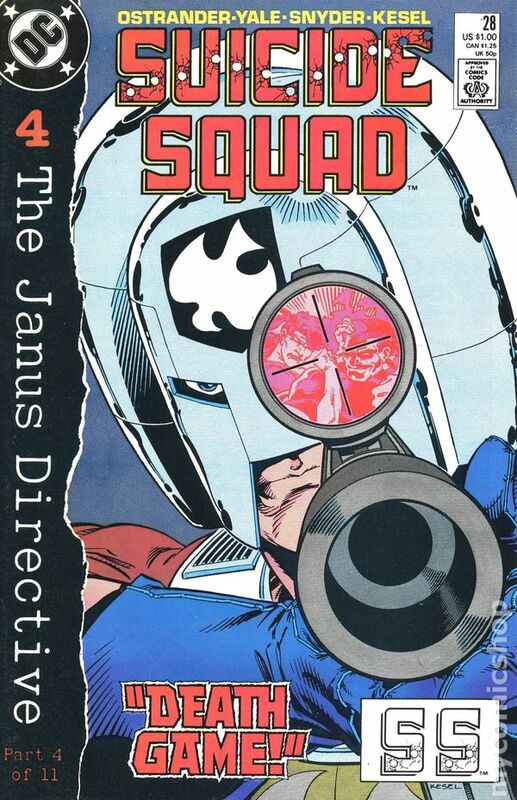 [The Janus Directive, Part 4]: "Death Game, scrip by John Ostrander and Kim Yale, art by John K. Snyder III and Karl Kesel; Furious that Harry tried to capture her, Amanda Waller sends members of the Suicide Squad to Checkmate headquarters where they end up getting involved in a pitched battle between Peacemaker and Major Force; They succeed in taking out both players but fail to bring in either Megala or Harry; Meanwhile, Harry is trying to defuse the Janus Directive conflict by sending Black Thorn to persuade Eiling of Project Atom to contact him so they can talk things out. Count Vertigo, Duchess, Shade, Vixen, Major Victory, Lois Lane, Nightshade, Captain Atom, King Faraday, Kobra app. Story continued from Checkmate (DC, 1988 series) #16 and story continues in Checkmate (DC, 1988 series) #17. 36 pgs., full color. $1.00. Cover price $1.00. Cover by Karl Kesel. [The Janus Directive, Part 8]: Heavy Squad, script by John Ostrander and Kim Yale, art by John K. Snyder III and Pablo Marcos; Checkmate, the CBI and Project Atom all attack the Suicide Squad headquarters in order to get to Amanda Waller; Once a hasty truce has been called between all teams, Waller explains that she was pretending to be a Kobra doppelganger so they wouldn't catch on to the fact that she was still herself and she could learn what she needed to know about their master plan. ; Waller begins to explain the true repercussions of Kobra's Janus Directive. Peacemaker, Checkmate, Black Thorn, Major Victory, Duchess, Bronze Tiger, Vixen, Ravan, Manhunter, Firestorm, app. Story continued from Firestorm the Nuclear Man (DC, 1987 series) #86 and continues in Checkmate (DC, 1988 series) #18. 36 pgs., full color. $1.00. Cover price $1.00. Cover by Karl Kesel. [The Janus Directive, Part 10]: Endgame, script by John Ostrander and Kim Yale, art by John K. Snyder III and Karl Kesel; Kobra's plans are foiled by the various government agencies as they work together to stop his pulse cannon and destroy his space ark. As Kobra was able to easily manipulate the different government agencies into mistrusting and fighting with each other, President Bush decides a little restructuring is in order; Sarge Steel is put in charge of all covert meta-human operations and Eiling is put in charge of all military meta-human operations. ; Checkmate is removed from Task Force X and absorbs Project Peacemaker. Story continued from Checkmate (DC, 1988 series) #18 and story continues in Captain Atom (DC, 1987 series) #30. 36 pgs., full color. $1.00. Cover price $1.00. Cover by John K. Snyder III and Karl Kesel. 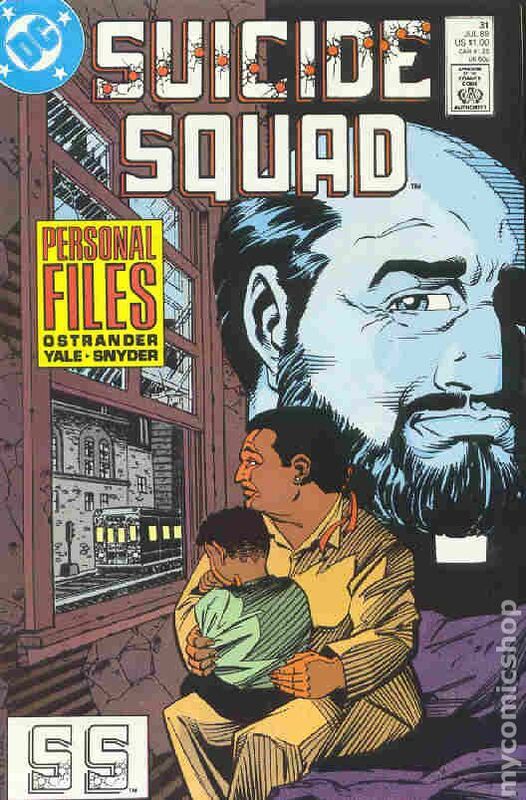 Acts of Contrition, script by John Ostrander, Kim Yale, and John K. Snyder III; Away with her child, Amanda Waller reviews her notes on Father Richard Craemer and his effect on the Suicide Squad. 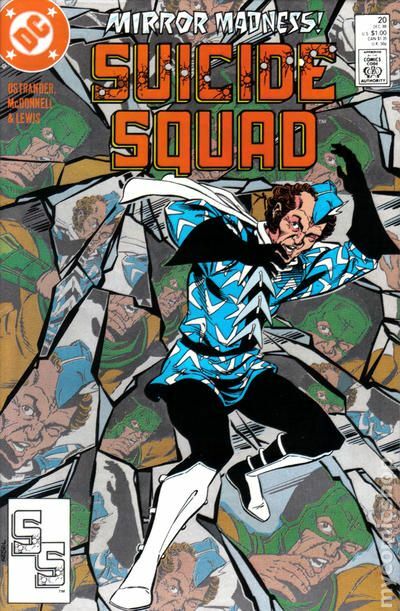 Major Victory, Ravan, Duchess, Doctor Light II, Punch & Jewelee, Captain Boomerang, Count Vertigo app. 36 pgs., full color. $1.00. Cover price $1.00. Cover by Karl Kesel. Steel Trap, script by John Ostrander and Kim Yale, art by Grant Miehm, K.S. 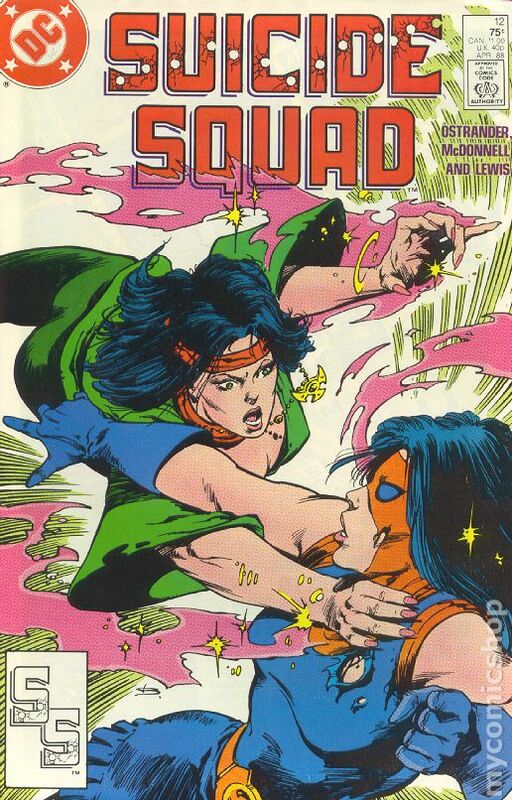 Wilson, and Kevin Phillips; The Squad is sent to Iran to prevent an execution; Also, Lashina ditches her Duchess disguise and makes her move. Sarge Steel, Amanda Waller, Duchess, Captain Boomerang, Bronze Tiger, Vixen, Ravan, Major Victory, Shade, Big Barda app. 36 pgs., full color. $1.00. Cover price $1.00. Cover by John K. Snyder III and Karl Kesel. Into the Angry Planet, script by John Ostrander, art by John K. Snyder III and Geof Isherwood; Duchess is ready to return home...to Apokolips, and she's bringing a hand-picked team with her. Deadshot, Poison Ivy, Ravan, Kobra, Doctor Light II, Shade, Amanda Waller, Bronze Tiger, Vixen, Major Victory, Captain Boomerang, Count Vertigo, Nightshade, Punch & Juwelee app; Oracle (Birds of Prey) mentioned. 36 pgs., full color. $1.00. Cover price $1.00. Cover by Karl Kesel. Armagetto, script by John Ostrander and Kim Yale, art by John K. Snyder III and Geof Isherwood; Duchess/Lashina reveals all while the Squad takes the scenic tour of Armagetto and has the fight of their lives; Amanda Waller versus Granny Goodness. Duchess, Deadshot, Poison Ivy, Ravan, Kobra, Doctor Light II, Shade, Bronze Tiger, Vixen, Major Victory, Captain Boomerang, Count Vertigo, Nightshade, Punch & Juwelee, Sarge Steel, Apokolips, Darkseid, Big Barda, a bunch of goofy Para-Demons, Forever People app; Oracle (Birds of Prey) mentioned. 36 pgs., full color. $1.00. Cover price $1.00. 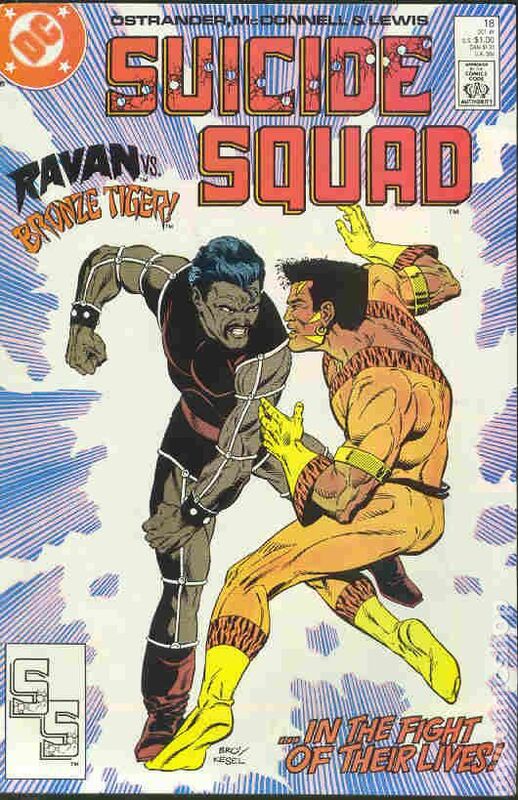 Bronze Tiger and Deadshot lead a rescue team to Apokolips to save Amanda and the rest of the Squad...but who's going to save them? 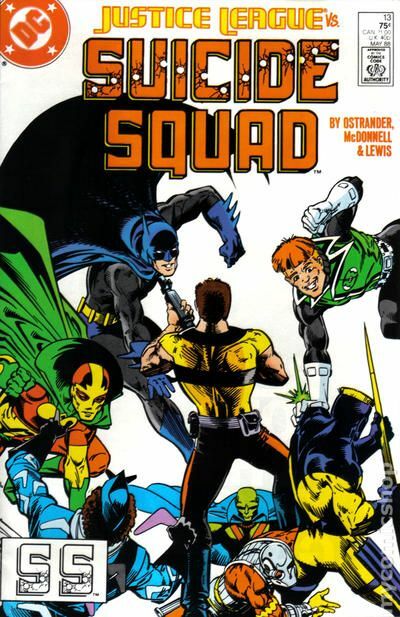 Written by John Ostrander, with art by Luke McDonnell and Geof Isherwood. Cover by McDonnell and Karl Kesel. Cover price $1.00. 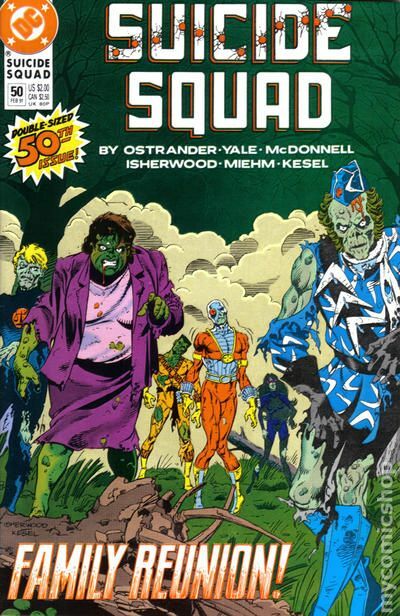 The Squad closes ranks in a desperate attempt to escape from Apokolips...but not everyone will get home alive! The Forever People guest-star. Written by John Ostrander and Kim Yale, with art by John K. Snyder III and Geof Isherwood. Cover by Isherwood. Cover price $1.00. Cover art by Geof Isherwood. 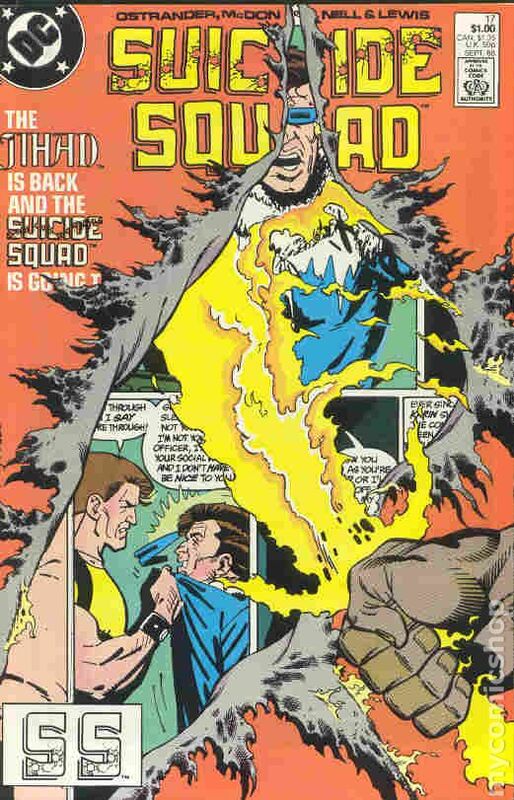 Threads, script by John Ostrander and Kim Yale, art by John K. Snyder III and Geof Isherwood; Squad returns from Apokolips, Shade the Changing Man returns to Meta, the pie-thrower is exposed and Captain Boomerang is exiled. Amanda Waller, Forever People, Vixen, Bronze Tiger, Deadshot, Count Vertigo, Poison Ivy, Nightshade, Big Barda, Punch & Juwelee, Doctor Light I, Doctor Light II, Captain Victory app. 36 pgs., full color. $1.00. Cover price $1.00. Cover by Kevin Maguire and Geof Isherwood. Caging the Tiger!, script by John Ostrander and Robert Greenberger, art by Luke McDonnell and Geof Isherwood; Learn the history of Ben Turner, as Sarge Steel tries to crack the Bronze Tiger; Jewelee learns she is pregnant. Amanda Waller, Vixen, King Faraday, Jewlee app. 36 pgs., full color. $1.00. Cover price $1.00. Cover art by Geof Isherwood. 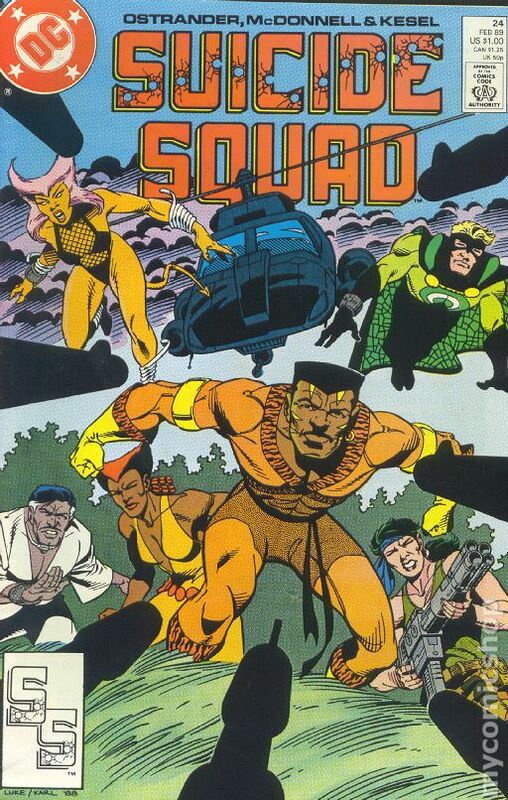 Dead Issue, script by John Ostrander and Kim Yale, art by Luke McDonnell and Geof Isherwood; The Squad is shut down; Amanda Waller leads ex-members on a raid to destroy the Loa. Major Victory, Sarge Steel, Vixen, Poison Ivy, Ravan, Deadshot, Punch & Jewlee app. 36 pgs., full color. $1.00. Cover price $1.00. Cover art by Geof Isherwood. The Phoenix Gambit, Part One: Ashes, script by John Ostrander and Kim Yale, art by Geof Isherwood; Sarge Steel offers to get Amanda out of jail if she'll start up the Suicide Squad again. Deadshot, Commissioner Gordon, Batman, Alfred, Butcher, Count Vertigo app. 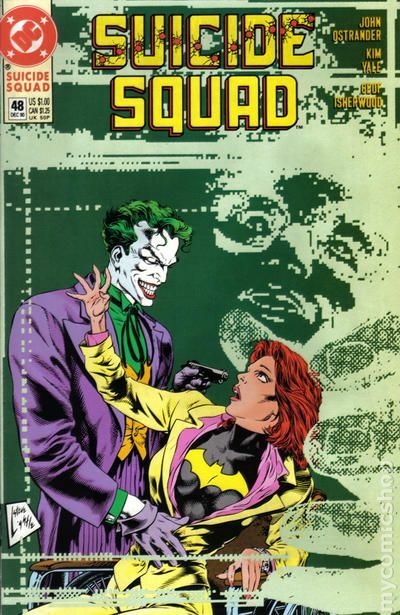 This story takes place one year after Suicide Squad #39. Pull-out Suicide Squad/Batman poster by Isherwood. 36 pgs., full color. $1.00. Cover price $1.00. Cover art by Geof Isherwood. 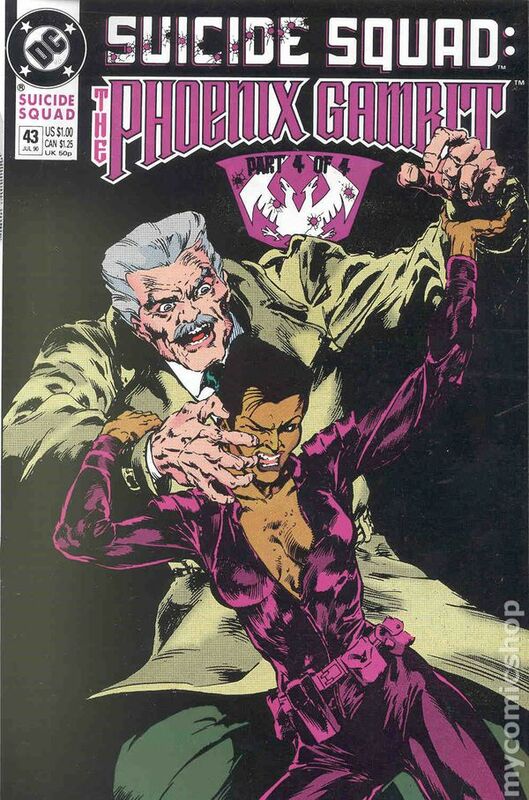 The Phoenix Gambit, Part Two: Embers, script by John Ostrander and Kim Yale, art by Geof Isherwood; Since their disbandment, the Squad members have gone their separate ways; Now it's up to the unlikely team of Amanda Waller and the Dark Knight to bring them back together. 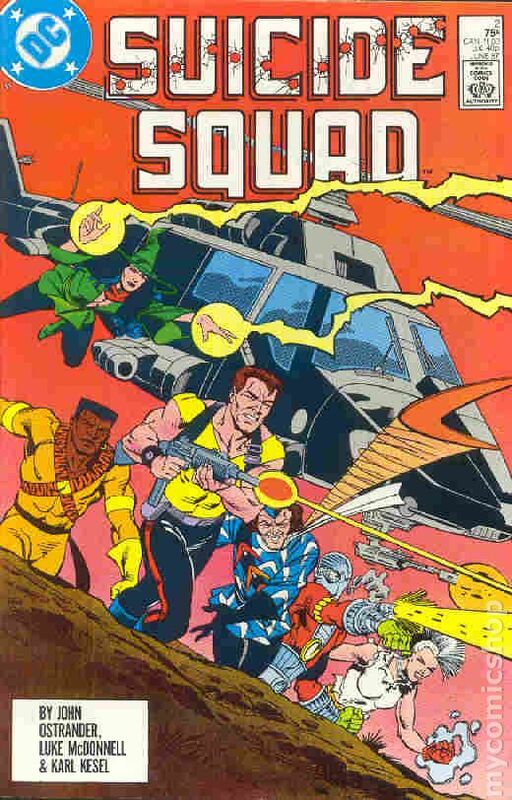 Sarge Steel, Deadshot, Poison Ivy, Bronze Tiger, Captain Boomerang, Ravan, Vixen, Butcher, Count Vertigo app. 36 pgs., full color. $1.00. Cover price $1.00. Cover art by Geof Isherwood. 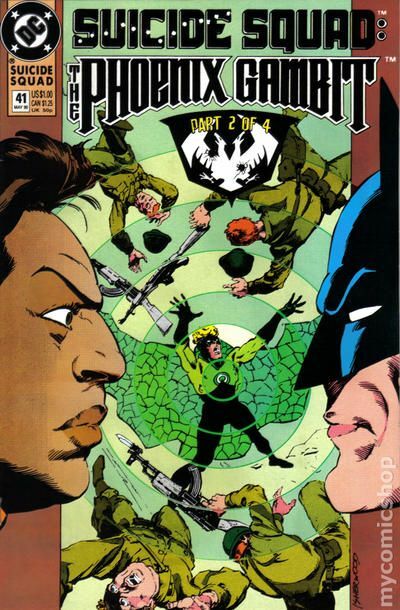 The Phoenix Gambit, Part Three: Firefight, script by John Ostrander and Kim Yale, art by Geof Isherwood and Mark Badger; In order to prevent a confrontation between American and Soviet forces in the war-torn country Vlatava, Batman and the Suicide Squad head to Europe. Amanda Waller, Deadshot, Poison Ivy, Bronze Tiger, Captain Boomerang, Ravan, Vixen, Butcher, Count Vertigo app. 36 pgs, full color. $1.00. Cover price $1.00. Cover art by Geof Isherwood. 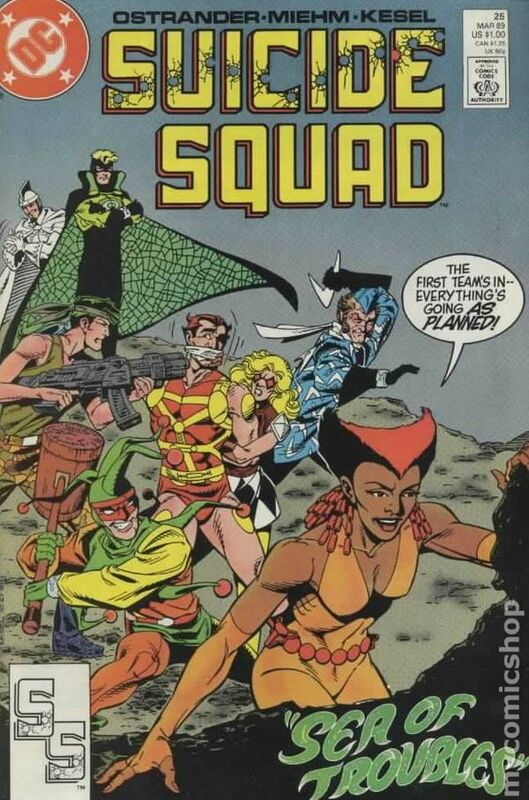 The Phoenix Gambit, Part Four: Black Queen's Mate, script by John Ostrander and Kim Yale, art by Geof Isherwood; The Suicide Squad must complete their mission in Europe in order to gain their freedom--and become independent agents. Amanda Waller, Sarge Steel, Deadshot, Batman, Poison Ivy, Bronze Tiger, Captain Boomerang, Ravan, Vixen, Butcher, Count Vertigo app. 36 pgs, full color. $1.00. Cover price $1.00. 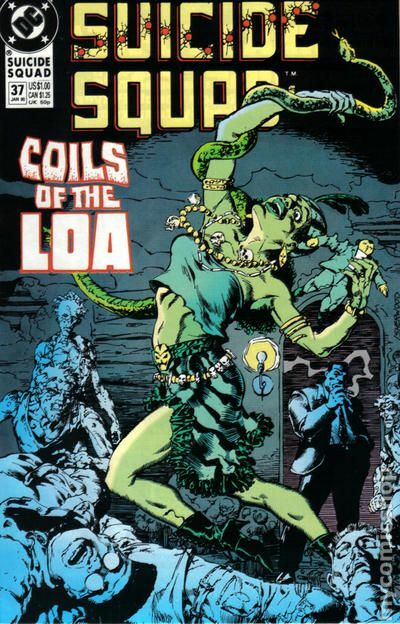 Cover by Luke McDonnell and Geof Isherwood. Grave Matters, script by John Ostrander and David M. DeVries, art by Luke McDonnell; The Ray Palmer Atom dies and a new Atom takes his place; Captain Boomerang goes to his mothers funeral and learns a secret about his past. Martian Manhunter/J'onn J'onz, Green Arrow (Oliver Queen), Green Lantern (Hal Jordan), Batman cameos; The Atom II, Amanda Waller, Captain Boomerang, Flash (Barry Allen) app. Ad for Bonk's Adventure for the TurboGrafx. 36 pgs, full color. $1.00. Cover price $1.00. Cover art by Geof Isherwood. 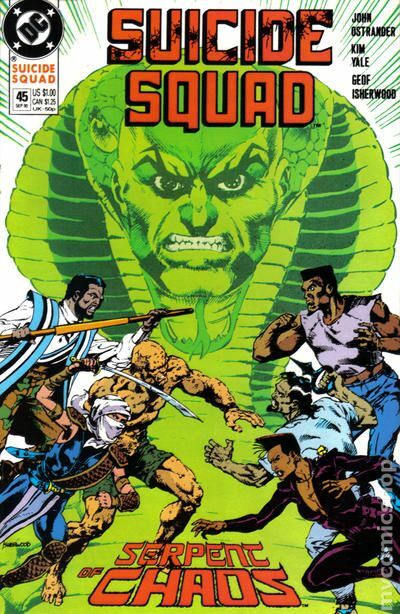 The Jerusalem Serpent, script by John Ostrander and Kim Yale, art by Geof Isherwood; The Suicide Squad meets their wits' end fighting with a new group called Hayoth; However, there's no rest for the wicked when their primary objective, Kobra, joins the party. 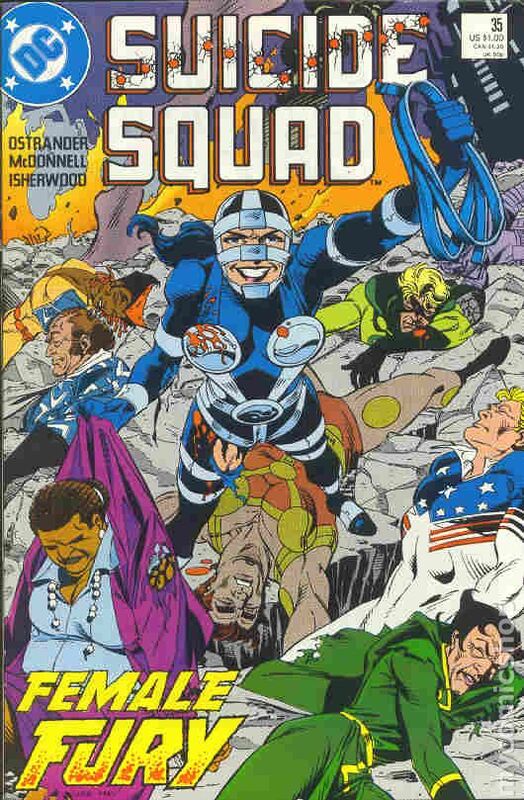 Amanda Waller, Kobra, Ravan, Bronze Tiger, Vixen, Deadshot, Captain Boomerang, The Atom II app. 36 pgs, full color. $1.00. Cover price $1.00. Cover art by Geof Isherwood. 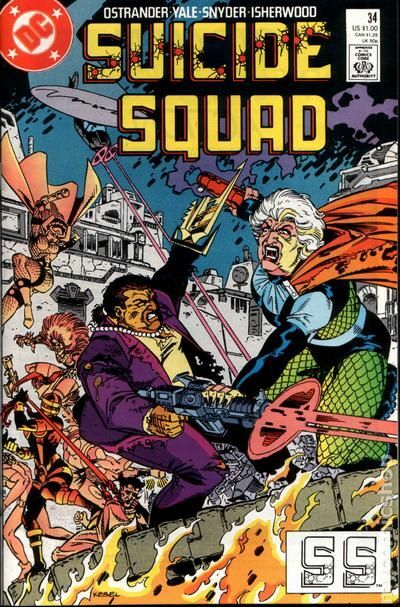 Choice of Evils, script by John Ostrander and Kim Yale, art by Luke McDonnell and Geof Isherwood; The Suicide Squad and Hayoth join forces to fight against Kobra, but Amanda Waller has her own set of terms for the team's cooperation. Poison Ivy, Count Vertigo, Kobra, Ravan, Bronze Tiger, Vixen, Deadshot, Captain Boomerang, The Atom II app. 36 pgs, full color. $1.00. Cover price $1.00. Cover art by Geof Isherwood. Choice of Dooms, script by John Ostrander and Kim Yale, art by Geof Isherwood; Kobra and Ravan fight and Ravan dies; The Israeli attack on the Mosque in Jerusalem is broken off. Amanda Waller, Poison Ivy, Count Vertigo, Bronze Tiger, Vixen, Deadshot, Captain Boomerang, The Atom II app. Ad for TurboGrafx 16 Splatterhouse game. 36 pgs, full color. $1.00. Cover price $1.00. This is a consignment item. A 3% buyer's premium ($1.43) will be charged at checkout. Cover by Steve Lightle. In Control, script by John Ostrander and Kim Yale, art by Geof Isherwood; A new and improved Thinker is slowly making his way towards Oracle, and Amanda Waller is desperate to find her first and come to the rescue. Count Vertigo, Cliff Carmichael/Thinker app. 36 pgs, full color. $1.00. Cover price $1.00. Cover by Norm Breyfogle. 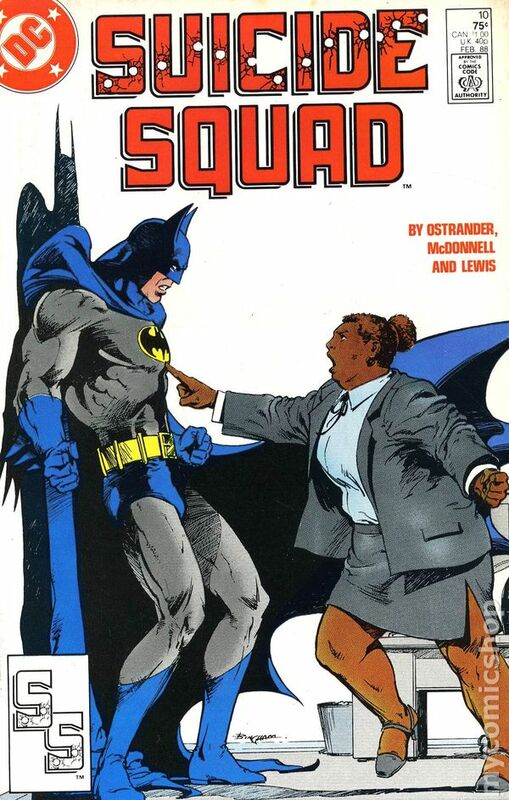 Out of Control, script by John Ostrander and Kim Yale, art by Luke McDonnell and Geof Isherwood; The Squad brings in the New Thinker and Amanda Waller makes a deal with Oracle. Deadshot, Captain Boomerang, Bronze Tiger, Cliff Carmichael/Thinker, The Atom II app. 36 pgs, full color. $1.00. Cover price $1.00. Cover by Geof Isherwood and Karl Kesel. 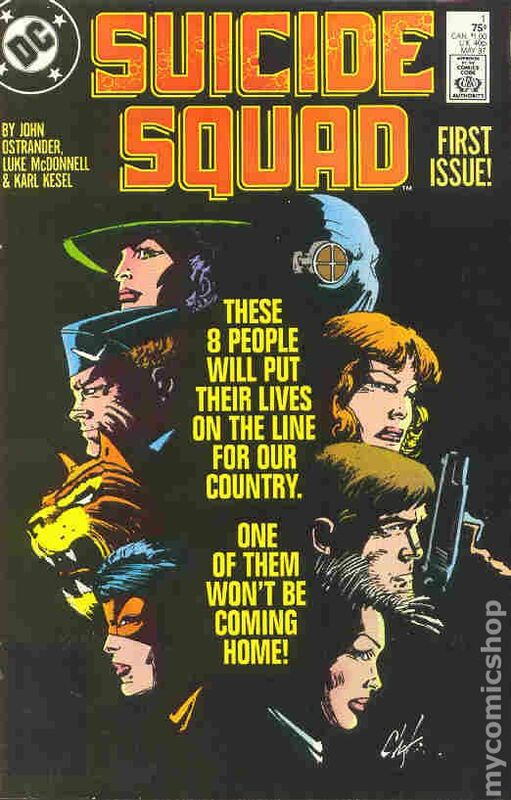 Debt of Honor, script by John Ostrander and Kim Yale, art by Geof Isherwood, Luke McDonnell, Grant Miehm, Karl Kesel, Geof Isherwood, and Luke McDonnell; Amanda Waller pulls the old Squad together to rescue the son of Rick Flag. 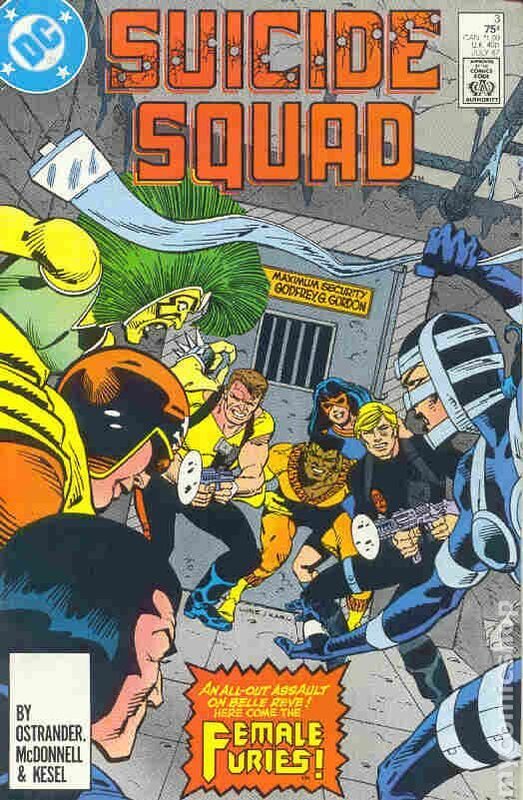 Nemesis, Nightshade, Deadshot, Captain Boomerang, Bronze Tiger, Cliff Carmichael/Thinker app. 52 pgs, full color. $2.00. Cover price $2.00.